I consider myself a good eater, that is I like a wide variety of foods and I am willing to try almost anything. But I have standards (which my husband calls being a party pooper) and if I can help it, I don’t eat foods that don’t do me any good or don’t seem fresh and vital. You can imagine what some of these things are, but one food that I never choose is deli coleslaw. Does anyone eat it or does it always end up in the garbage? Traditional coleslaw always seems so tired to me, overdressed with mayonnaise and soggy. And I always have the feeling it was made a way long time ago. But it’s such a shame, because the foundation of colelsaw is something actually quite good for you — cabbage. So full of Vitamin C, fiber and antioxidants, plus it’s cheap. I decided it was high time to revisit coleslaw and give it a makeover. All I’m looking for is a crunchy, fresh, tangy side dish that will be perfect with all the grilled yummies that are served in the summer. We eat lots of Mexican or Tex-Mex-type food around here, as well as simply prepared fish. Cilantro and lime are the natural flavors that first came to mind. 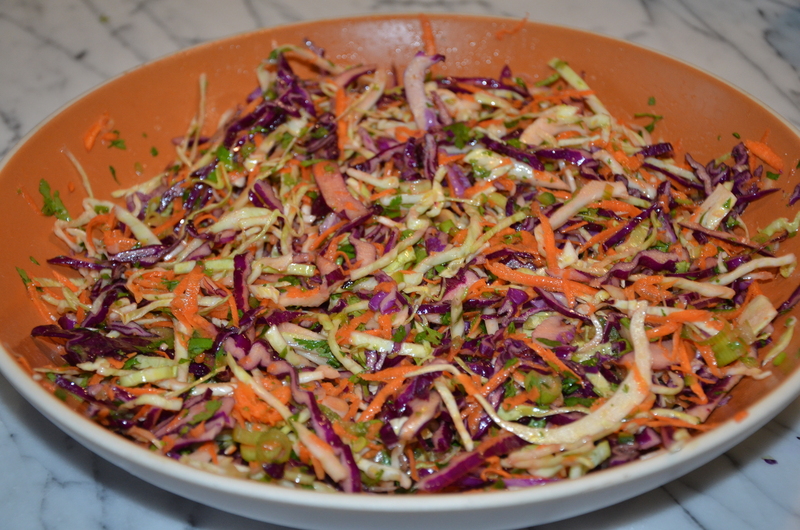 Because cabbage is available all year long in California, I make this slaw all the time. 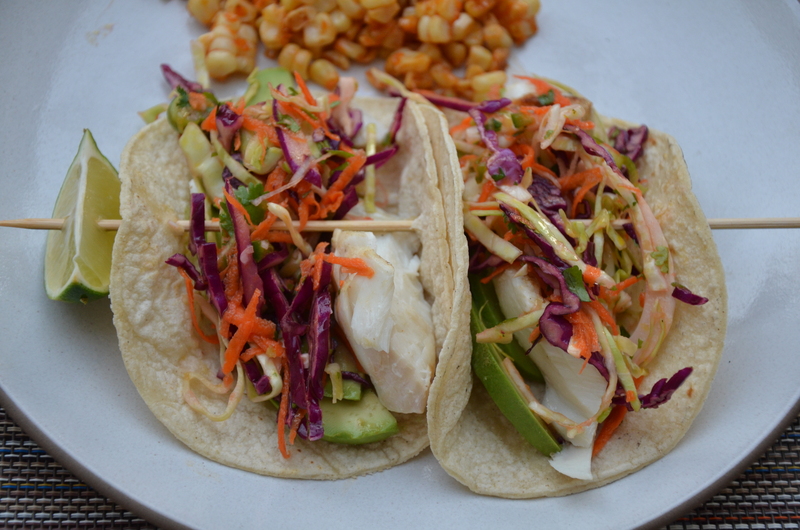 I just prepared it the other day for fish tacos, but very often I serve it alongside fajitas or grilled salmon. My daughters make their own crazy taco combination with black beans, this slaw and feta. 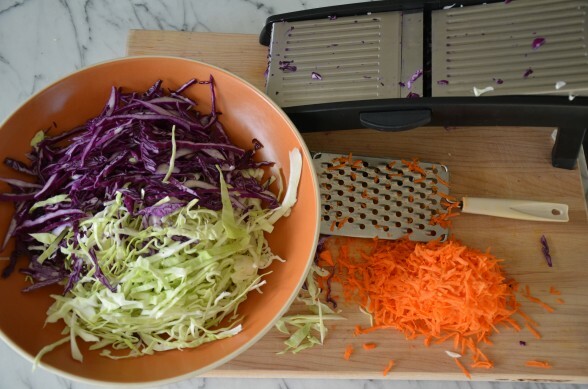 I generally use just green cabbage for this slaw, but I happened to have a some purple cabbage in the fridge and in my book, the more color the better, especially purple which is a color we don’t find too much in nature. Since I know Mr. Picky will eat this slaw with tacos or grilled fish, I’ll be making a batch this weekend when he returns home from camp. We miss him desperately and I know he will need some good nutrition if his letter home is any indication of what he’s been feeding himself. Who you callin’ “party pooper”? Core the cabbage and slice very thinly. I used a mandoline, but a sharp knife works perfectly well. Place in a large bowl with the grated carrot, scallions, jalapeno and cilantro. Toss to combine. Add the lime juice, olive oil and salt to the cabbage mixture and combine well. Taste for seasoning. *Leave the seeds if you like it hotter. I made this last week with your slow cooker bbq chicken and it was wonderful. We had also had it with bison burgers. My 15 year old opted for no condiments either night, just this slaw on his bun w/ the meat. I used pre-shredded broccoli slaw but will try cabbage next time. I love the lightness of the dressing. Great combo, Lisa! So glad the family enjoyed it. Thank you! The slaw was fantastic! I also dressed the salad about 40 minutes before we ate it and thought the cabbage absorbed some of the dressing. We ate it with the delicious and easy tortilla soup. The cabbage definitely softens up if it sits. I like it both ways, glad you did, too! Delicious and easy. Whole Foods even sells the cabbage shredded to make it even easier! Pre-shredded cabbage? No excuses now! i loved it! one question i had — i made it and then waited until we were almost ready to eat to put dressing on. When i tasted it the cabbage was kind of hard but after it sat in the dressing for a while it softened up and tasted better to me. do you let it sit for a bit before serving? thanks for all the great recipes! There is not one i have not tried that i did not love. Good question! You don’t “need” to let the cabbage sit in the dressing unless you want to soften it up. I like it a little crunchier for tacos, but I guess it’s really your preference. I should have also mentioned for people who can’t digest raw cabbage, you can pour boiling water over the cabbage and then shock it in ice water. It just takes a little of the raw edge off. what is the corn dish on the back of the plate? i am going to make tacos and this slaw for a big group and was looking for another interesting salad or side. thanks! The side dish on the plate is what I call “Mexican Street Corn Off-the-Cob.” I never serve corn on the cob anymore to guests since I’ve noticed that people don’t like to eat it in front of other people. I’m teaching this during August. Grill the corn until it chars a little. Cut it off the cob and saute it with a little butter, smoked paprika, chili powder and salt. 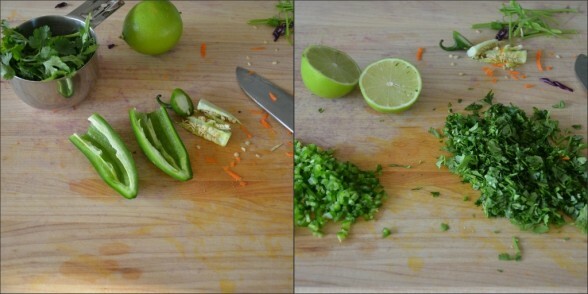 Finish with a squeeze of lime. Sometimes I top it with a little feta, although crumbled Cotija cheese is more common. Or just cut corn off the cob and saute with a little butter and salt and it’s the easiest yummy side dish ever. I made the slaw last night and it was terrific! 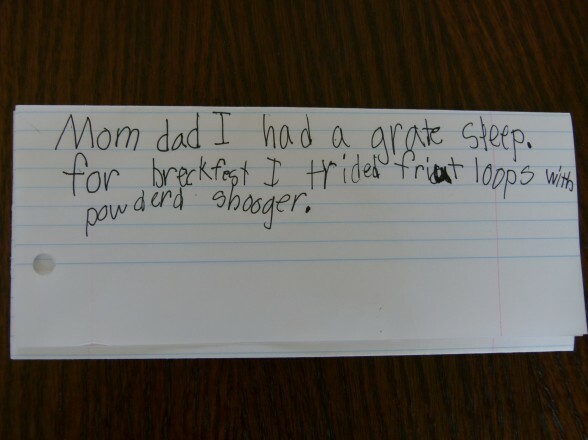 But I couldn’t stop laughing thinking about your son’s letter. That was great! Glad you liked the slaw! And the letter! Hysterical! I’m making the slaw tonight. That is the cutest darn letter I have ever read!!! You MUST save it! I just bought a cabbage at the farmer’s market, so I will try this recipe tomorrow. Have you tried adding almond butter to the dressing? Yes, the letter is a keeper. Never though to add almond butter, but if you do, please let me know how it turns out! 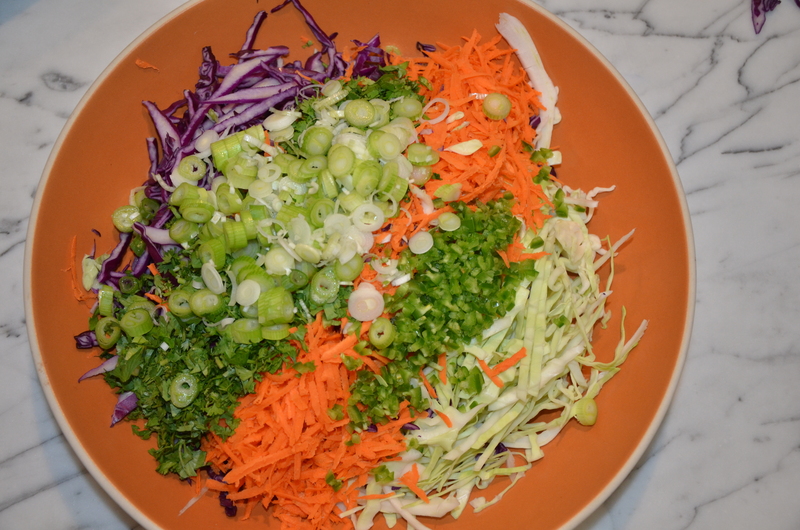 I love how colorful this slaw is. I usually don’t like coleslaw either, but this seems more like a salad. I’m going to make it this weekend with barbequed chicken. Thanks! It will be awesome and you’re right, it’s like cabbage salad. Love this slaw recipe! Loved the letter from Mr. Picky even more!! !